Ally and Barry held hands and walked towards the sun, setting over the Blue Ridge mountains looming in the distance beyond the row of evergreen trees. I just love the way the sun shines in and illuminates the newlyweds. This is the king of setting a wedding photographer dreams about, and we are lucky to have near us in Greenville, SC. The bride is wearing a lace ballgown with lace spaghetti straps and caring her cathedral length lace veil through the grass field. The groom is wearing a dark gray suit. 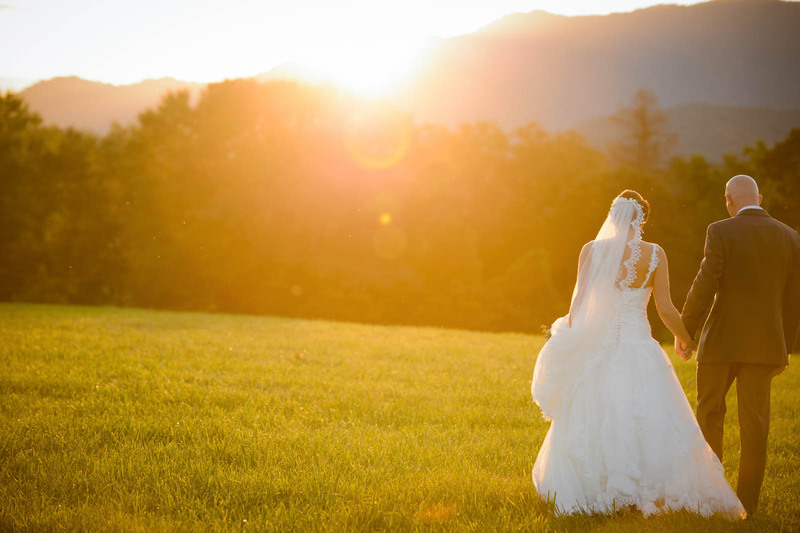 The couple snuck away from the cocktail hour of their reception to catch the sun setting over the mountains at The Farm in Candler North Carolina.